Did you know that Russia has its very own awards contest for office design and furniture? We’ve found a great photo collection of award winning offices that feature some ultra-modern desks. New Orleans is already experiencing its typical warm temps and humidity this spring. But nighttime temperatures are still hovering just above freezing in Moscow. In a land with so much frozen precipitation, it’s no surprise that snowy white is a popular color for office furniture. It’s all about the cool factor. Take a look at the images at officenext-moscow.com (scroll all the way down) and then let’s consider ways you could use similar designs and concepts in your office. Picture #2 in the slideshow for this award winner features a trapezoidal white desk in a conference room. That’s a great outline to use in an odd shaped room if you want to create a unique look. It’s also a good shape for putting in a corner to use space effectively. 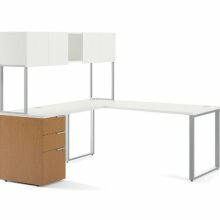 In fact, the trapezoid is a favorite for training and meeting rooms when multiple tables or desks need to be configured as a continuous worksurface. Want an imposing reception desk that still allows your lobby to look open and airy? White is the way to go since it looks great in natural light supplemented with recessed lighting that makes the desk appear to glow. Choose a design with a textured surface to give the furniture depth. Otherwise, it may appear too blank and featureless. Pair the white desk with a deeply hued wood floor to ground the design. Oh yes, this company does have offices in Moscow too! This firm has decided to take its signature tangerine logo color and pair it with white desks and cubicles to create a fully branded workspace. The use of tropical colors in chair upholstery and cubicle panels offers a gorgeous contrast to the clean and simple lines of the worksurfaces. Here’s another office where white furniture makes it easy to use color throughout the space. Slide #6 shows three rooms side by side, each with brightly colored walls. One room is green, one blue, and one red. The common features that tie them all together are white desks and tables. Perhaps white is the new black for 2013. Looking for the right place to source snowy white office desks? New Orleans businesses don’t have to shop in Moscow or St. Petersburg. We can find the perfect modern furnishings for your office much closer to home. If your office design fits any of these descriptions, don’t be embarrassed. Office design and furniture procurement is something most businesses do very rarely – and it’s often easiest to just let things grow “organically” while you focus on other things. Just realize that you can actually help your company become more efficient and profitable with the right planning. You don’t necessarily have to start over from scratch (although we’re more than happy to help you do that). We can assist you in getting a handle on your current inventory so you know what can be repurposed and what needs to be upgraded. Our space planning and design consultation happens on-site, so we really get a feel for where things strayed off course. Call us today to schedule a free visit – let’s plan together! Should You Choose L Shape Desks for Your Workplace? 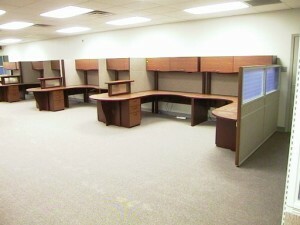 L shape desks are one of the most popular options for workstations. They occupy the middle ground between the full “U” and the minimalist rectangle. Here’s how to know if they are the right style for your office. Do Employees Still Need Dedicated Storage for Files? One of the standard features of most L desks is a full set of file drawers (sometimes two sets). If your office is entirely paperless, there’s little need for such accommodation at each workstation. The same holds true if you can get away with using a centralized filing system for an entire department to hold shared resources, documents and reference materials. Employees do often still like to have an expansive worksurface to hold supplies, accessories and paperwork. However, offering lots of extra space can sometimes encourage clutter. You might consider limiting the number of L shape desks and adding some shared meeting spaces with tables. Here, employees can spread stuff out to work on temporarily, but they’ll be expected to clear off the surface afterward. If you go with less desktop space per employee, add vertical or under-desk storage space for office supplies and other workplace paraphernalia. Just be sure that reducing desktop space doesn’t mean employees have to bend, reach or stretch too much to get to frequently used items. This might increase the risk of repetitive stress injuries. When Do L Shape Desks Make Sense? We’re not trying to give you the impression that the L shape is never a good idea. In fact, that extra arm can be quite useful. In open office layouts, bench style workstations with everyone sitting side by side save lots of space. But they definitely aren’t everyone’s cup of tea. An L shape can provide employees with a sense of having a boundary between themselves and coworkers. This makes it an excellent fit for office cultures that place a high value on personal space but where you don’t have room for fully enclosed U shape desks. At the same time, that extra desktop space can actually make it easier for employees to collaborate occasionally. There’s an area of the desk available to share without the monitor and other computer equipment getting in the way (which might be a problem with a rectangular desktop). And, the desk isn’t so enclosed that cozying up to work side by side would feel awkward (a pitfall with a U shape desk). Professional space planning is really the best way to figure out for sure if your business will fall in Love with the L desk. Contact us today to schedule your free consultation. You don’t want employees kicking back and putting their feet up on their desk. But they should have some way to alleviate the pressure on the back of their thighs. A stationary foot rest is an excellent option. Today’s advanced models allow workers to move while they sit, working their joints, muscles and tendons to keep circulation healthy while relieving aches and pains. Some even feature wheels like miniature skateboards and can be rolled to any area of the workstation while the user remains seated. According to research conducted by the GSA, electricity usage plummets and employee satisfaction soars when workers have control over the lighting at their own workstations. In one study, only 55 percent of employees said their standard lighting was comfortable. After they were given the option to adjust their own lighting, that number rose to 70 percent. Retrofitting overhead lights so they can be dimmed or brightened by individual employees shows the biggest benefit. But even supplying a task lamp on the desktop can make a difference. LEDs are the most energy efficient and can closely mimic natural daylight. The latest designs reduce glare and shed an even light across the worksurface. Sitting all day is being linked to more and more health problems including metabolic syndrome, obesity, heart disease and early mortality. In contrast, standing more at work is associated with a number of improvements in health including less back and neck pain and even better moods. You can review an enormous amount of scientific literature on this topic at juststand.org. Of course, you don’t have to buy height adjustable desks for your employees to enjoy the perks of varying their posture throughout the work day. Just add a sit-to-stand monitor arm and keyboard tray attachment that clamps onto any existing workstation. For more ideas on ergonomic Metairie office furniture and accessories, contact The Office Planning Group anytime! New Orleans office furniture should be as rich and interesting as the history of this region in Louisiana. That’s why we offer a remarkable selection of commercial grade office desks and casegoods in a wide variety of finishes. Each design features solid construction with the finest veneers to make wooden office furniture the highlight of your office décor. You can order matching desks, reception terminals, conference tables, storage and even custom-made items in your favorite grain and stain. Here’s just a peek at some of our most popular “flavors” of cherry finish along with ideas for how to pick the best one for your office. The warm reddish brown of this cherry stain is gorgeous, but it never drowns out the details of your furniture. Use it for even the most ornate, antique inspired desks to draw attention to particularly stunning design and craftsmanship. This is a deep stain that marries the warmth of cherry with the depth of mahogany. Its burgundy sheen will remind you of an expensive pair of leather dress shoes with a mirror-like polish. Use this finish to set a serious and imposing tone in an executive office. Or, use it to add surprisingly delicate details for reception area occasional tables. Do you really like a cherry stain but still want to see the grain of your wood veneer? A lighter version lets the natural beauty of this classic wood shine through. Opt for this finish in open plan offices where desks are all in plain view (you wouldn’t want to conceal this gorgeous wood with cubicle panels). This warm honey finish provides a modern twist on traditional cherry. It looks almost as sweet as maple and can be used in any area where you want the aesthetic of wood without dark overtones. Refresh and update your office environment by pairing this wood finish with laminates, glass, and textiles. This luscious red cherry makes a bold statement. It doesn’t need fancy detailing to make it pop, the wood speaks for itself. Mix empire with unusual materials like marble, slate or copper to create an opulent office ambience. Would you like more advice on how to pick really “cherry” New Orleans office furniture? Give us a call anytime.